Nimble Mobile 3.0 now lets you send, track, and measure email engagement on the go! Please note, the ability to send and track messages from within the Nimble mobile app is currently only available within the iOS version. We plan to introduce this feature for Android in Fall 2018 - please keep an eye out for updates! Please click here for a full walkthrough of Nimble Mobile 3.0! Write your message from scratch, or load a templated email. Note: templated emails must first be created in Nimble's web app. Learn more here. This video covers the common workflows for viewing Email Tracking reports. On a Contact Record, select the envelope icon to send an email. Select the tab to "Enable Email Tracking" to track this message. If you have a pre-created template, select "Template" to load one of your templates into the email form. All of your email tracking history is available to review in the "Email Tracking" tab on Nimble Mobile. Simply select "More" to pull up tracking history for all Individual and Group Messages. 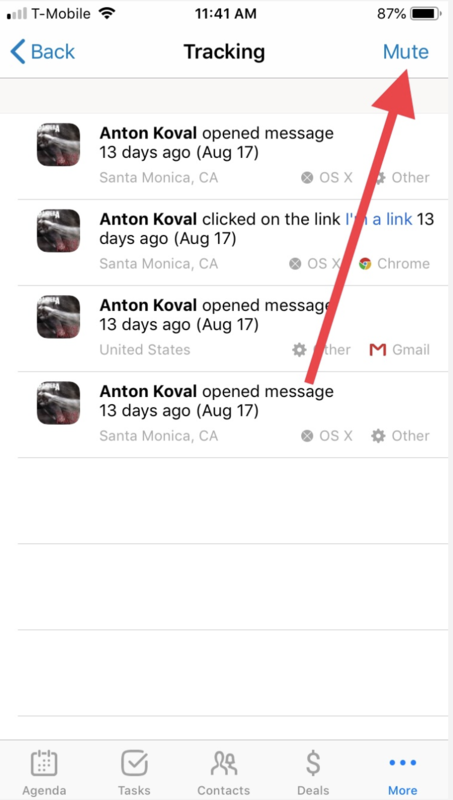 Tap into a specific message to see a running stream of activity on your tracked message. 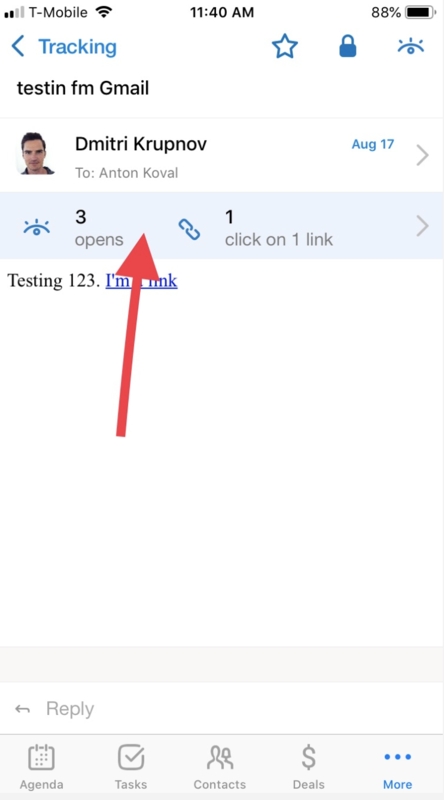 See opens, clicks, and attachment downloads in one complete view. 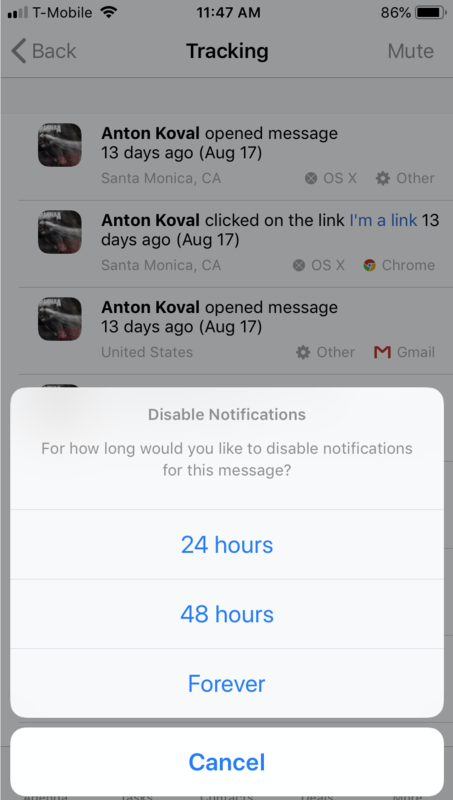 By enabling push notifications in your Mobile app settings (iOS only), you will be able to see notifications for when someone opens or clicks on a link on your mobile device. Learn how here. In some cases, you might want to mute push notifications from a tracked message. This could be in response to receiving too many notifications about a particular message, or perhaps you are more interested in seeing who comes back to your email a day or two later, instead of who opened it right away. When you've made your selection, you will no longer receive push notifications for that particular tracked message until the set time passes, or until you manually unmute them. You can do this at any time by going back to the tracking details for the message and selecting "Unmute" in the top right-hand corner!